Try out these few super-simple, hassle-free snacks that can be ready in just minutes! The best part is they all can be stored in the fridge/freezer to your convenience! Simply blend watermelon together with strawberry, or any other fruity combinations the kids love, add some lime or lemon zest (optional) and pour them into popsicle moulds. After 3 – 4 hours in the freezer, you have the perfect hot weather snack! This can be done in just 5 minutes! Simply use a food processor/blender to mix some dried fruits like cranberries, raisins and dates, add in some rice puffs and a little yoghurt. Next, just scoop with a tablespoon and roll them into a ball, and garnish with coconut flakes if you prefer. Store them in the fridge for up to a week! For a full recipe and instructions click here. 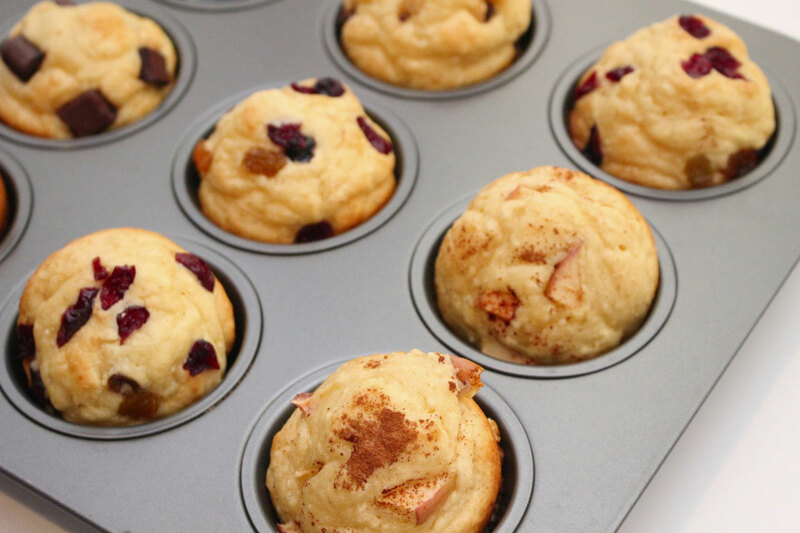 This one is cheating – but satisfies both pancake and muffin cravings at the same time! Get a pancake mix (instant if you want to save time) and add an extra egg for fluffier muffins, mix in anything you want, chocolate chips, blueberries, cinnamon sugar or even bacon toppings. Grease the muffin tray and fill it 2/3 full after preheating the oven at 350. Bake for 15 minutes or until a toothpick comes out clean. Click here for the detailed how-to! Simply use a food processor to mix 250g of cream cheese, 250g of strawberries, a zest of lemon and 2 cups of desiccated coconut till you get a thick dough-like consistency. Roll each tablespoon into a ball and cover them in more desiccated coconut(optional) and put them in the fridge for 3 days or freezer for up to a month. Defrost in the fridge before serving them again. Mix 1 cup of self-raising flour, 1 egg, 1 cup of milk and 1 cup of pineapples or blueberries (or any other fruit the kiddos like) and pour tablespoonfuls of the mix onto a greased pan over medium heat. Freeze well to store them. For full instructions see here. RELATED: Does Your Child Have Bad Eating Habits?